Japan's Economy - No End in Sight? As I wind up, post exam session, for some serious economic analysis it is to an economic landscape which is increasingly looking like a surreal mixture between Kafka and Dali. Having been paying only scant attention to the data stream the past 5 months, I have been adequately awake to note that the incoming barrage of data from the real economy has been absolutely horrendous. And this, incidentally, is not only the case for Japan. Clearly, we will get to the other side since such is our nature, but the amount of bodies we will leave in our wake may turn out to be quite substantial. In my opinion, this is exactly the main challenge which confronts at the present time; to identify the cases where the risk for a serious fallout is largest, and then to act. One of those places may well be Japan and although she will still be one of the world's largest economies tomorrow and the day after tomorrow the data is still screaming, I think, that Japan is different and that understanding the why and how is crucially important to get the big global picture. As per usual I shall be taking a bird's eye view of the Japanese economy homing in, when necessary, on the specifics. The topics covered should be well known to regular visitors in the form of output, prices, household demand, corporate capex, the external sector, and then finally what actions taken by policy makers to tackle the issue. Leafing through my articles, the last time I had a look at Japan I simply noted that the recession was now, well and truly, here. This view was not completely rooted in the consensus although my favorite Japan watchers (MS' Sato and Ken Worsley) had already been delivering the same basic message through their writings. As it turned out, the official recession call came just in the knick of time before the house of cards finally collapsed. Thus, and although this is old news at this point, why don't we have a look at a simple chart of Japanese quarterly output since Q1 2006. Within the alphabet soup of various definitions of recession Japan conforms to the conventional adage of two consecutive quarters of negative growth (a technical recession in the jargon). 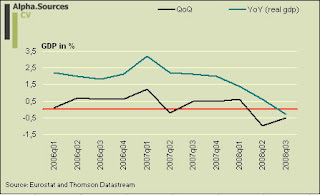 In Q2 and Q3 2008 Japan's economy contracted 1% and 0.5% respectively. Furthermore, if we scrutinize the smoother y-o-y figures of real GDP we observe the interesting fact that, on this measure, Japan's economy has been steadily slowing since the beginning of 2007. This is interesting in the context of just what effect the current travails of financial markets have had on Japan in the context of a cycle which so obviously were about to turn in any case. Turning to the immediate news in off the wire the situation in Japan apparently went from bad to worse and then onto horrendous in Q4 2008. The latest data points from December are thus quite staggering as will also be detailed below. Unemployment up from 3.9 to 4.4 %, consumption down 4.6% and most importantly (perhaps) factory output slipped a handsome 9.6% in December which confirms the worst fears in the context of the incoming manufacturing recession. Finally, we have the important leading indicator in the form of the PMI which is already released from January and as we can see, the downward trajectory is pervasive. As per usual in these indices everything below 50 marks a contraction. Let this then be a subtle warning of what comes next. As a well known Achilles heal in the Japanese economy the consumer is still mired in a slump which has now, effectively, extended almost a year . 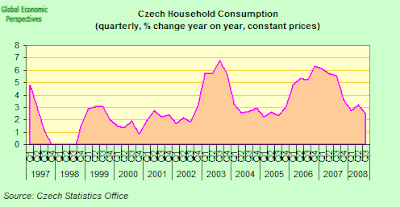 Consequently, 2008 looks set to become a year where headline household consumption fell in 3 out of 4 months. Breaking these figures down reveal that the retail sector in Japan is struggling. As per usual Ken Worsley provides the ammunition and although convenience store sales were up on the whole year in 2008, the more broad based purchases proxied by supermarket sales and department store sales are almost certain to reflect the general trend. In November 2008 department store sales slid 6.4% which marks, following Ken, the ninth consecutive decline. 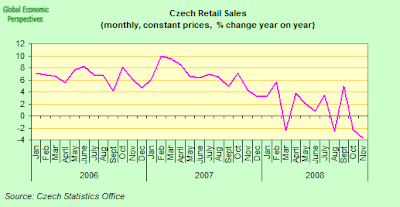 As for the overall retail sales gauge November marked the third consecutive monthly decline. On a broad measure retail sales registered a drop of 2.7% yoy in December which was the largest monthly drop in four years. 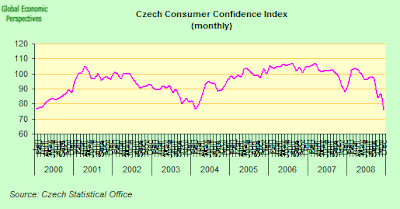 Finally, the figure reported by the media in the form of overall household consumption expenditures solidifies the analysis showing a thoroughly negative trend on a monthly basis throughout 2008. As noted above, the latest -4.6% shocker for December solidifies the overall trend. The fact that the Japanese consumer is not providing a cushion for the deterioration in corporate capex and exports is not surprising. However, it does represent an added issue since we could reasonably ask how long we should expect to observe these perpetually declining figures for domestic consumption? This is a non-trivial question since consumption still represents around 50-60% of the Japanese economy. Thus, one thing is if the consumer is not contributing to growth but quite another is if the domestic economy now spirals down into a black hole regardless of what happens on global markets. Forward looking indicators for consumer sentiment suggests that we are some time away from a pick-up in any sense of the word and while consumption can hardly be a bigger drag on growth than is currently the case, it still constitutes a tough starting basis upon which to stage a "recovery". 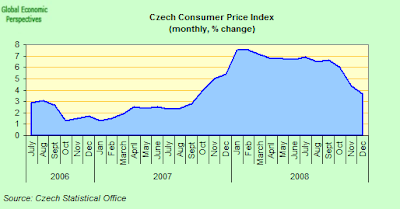 Prices, the return of an (un)welcome friend? One obvious topic bound to come back with a vengeance in the context of the present slowdown is the prospect of a solidification of the deflation which, despite many an odd economist's predictions, Japan has never escaped. Well, if you want to nit pick Japan could still have made it in 2008. Thus, the mean value of the y-o-y monthly increases in the core of core up until November was 0.0% and with today's 0.0% reading for December Japan still has not created one year of domestically induced inflation for a long time. One thing is sure then, whatever some will have you believe, deflation is still a major preoccupation for Japan and in light of the fact that we are now entering the worst year for the global economy in several decades, I would humbly submit that comments about an escape from deflation best be kept under raps. Apart from the US style core index' linear walk above and below the 0% mark the graphs above also show how the big inflation panic observed 6 months ago exclusively came from headline pressures and did not, in any sense of the word, produce second round effects in Japan. This is to say that even though the core index spiked significantly in the year from august 07 to august 08 it did not pull up the core-of-core to any significant degree. My initial statistical analyses (more to follow) suggest that the relationship between the US core and General core index has steadily deteriorated since 1971 and is almost non-existing at this point. Or to put it briefly; we have indeed had cost push inflation but not demand pull.It is interesting in this regard to watch how, as headline inflation abates, the inflation indices are nicely coming together. In connection with the heated debate of second round effects and the scare from energy push inflation I feel vindicated from the current message told by the data in both Europe and Japan. This does not mean that inflation may not come back in the form of a pressure on commodities and the barbarous relic(s) as the global central banks flood the system with fiat money. This would then be a scenario of stagflation which it looked as if we would tussle with half a year ago. Yet, at this point in time I think risks are still more heavily tilted towards deflation as the main global macro concern. Many of the smartest people around seem to think the same; a couple of days ago John Hempton suggested that the Fed actually bring the helicopter metaphor to life (and here) and before you discard it as a bad joke, you would be wise to look at the underlying argument since it is all about the key aspects of monetary policy in the context of the liquidity trap. And finally of course, we have Cassandra's well thought note on inflation v. deflation  which as ever is a must read. In this environment then, it seems all but a question of time before Japan once again slips into deflation with respect to core prices. Of course, asset prices in Japan have been in fast decline for quite some time , but with unemployment coming onto the scene it appears that another nudge down into the basement for domestic demand will strengthen the path towards deflation. One thing which is often forgotten in the context of this almost omnipresent pessimism that has grapped economists and commentators (which would include myself) is that Japan did actually manage to churn out growth during the past three to four years. What I, and others, have simply been pointing out in the face of those heralding the return of Japan among the leaders was the nature of this growth, where it came from, where it did not come from and consequently the very nature of Japan's way of creating wealth to pay for its rising liabilities. Thus, it should be a well known narrative by now that Japan is dependent on export and foreign asset income to grow. It is important to understand the fine print here. What I am not saying is that domestic demand is trivial; it isn't. What I am saying however is that on the margin and in terms of ensuring a "respectable" growth rate Japan simply needs the boost from exporting its surplus goods and capital abroad. Absent this surplus the domestically induced capacity and subsequent trend growth would simply not be "adequate" (i.e. nothing to fall back on) and in fact, it is not at all theoretically impossible to envision a negative trend growth rate in countries such as Germany, Italy, and Japan in the absence of external demand to buy a given surplus of production and capital. It is quite obvious from the graphs that the slump in corporate capex decidedly set in q4 2008 which is also evident from the most recent industrial production print. Thus, by scrutinizing the graphs of quarterly moves it only shows a timid decrease due to the fact that it only includes data up until Q3. However, by looking at the monthly graph which includes the first two months of Q4 as well as the graphy plotting monthly and annual changes, the picture changes strikingly. Predictably, and following a pattern from other Japanese recessions, core industrial production which is most sensitive to global trade volume has tanked completely. The only thing which is preventing the composite index from following the same trend is that the decrease in the services industries (which comprise some 60% of the total activity) has seen a more modest decrease. The reason why industrial production has now finally fallen off of that famous plateau analysts have been talking about is a slump in export growth and thus the trade balance. Of course, the graph to the right is not really indicative in the current form. The way to read it however, given that it is monthly, is to realize that as long as the graphs stay in positive it means a steady accumulation of surplus versus the rest of world. In this way, the consecutive sign of the monthly number is more important than the actual level of the number. And then again ... it is quite clear that exports have steadily trickled down and if the trend continues (especially with the strong Yen) Japan may find itself with a trade deficit in the first quarters of 2009. On the other hand however, an often overlooked part of Japan's external balance is also revealed in the graph. Consequently, the current account is still firmly in black due to the stable revenue from a large portion of foreign asset. It is quite certain that in the current environment, foreign asset income will go down but since most of Japan's foreign assets are held in the form of bonds the income is more stable than if it had been equities or other kinds of investments. There is of course always the risk of default and we saw how more than a few eyebrows were raised in relation to the break up of Lehmann Brothers and their large amount of samurai bonds held by Japanese asset managers and investors. Ultimately though, the income balance and its positive contribution is about the only positive thing to remark about the Japanese economy at the moment. The JPY, adding insult to injury? As a final nail in the coffin of Japan's outward looking companies the global environment of deleveraing and rising risk has, as per reference to well known empirical regularities, brought the JPY to levels not seen in a long, long time. It is evident that while the initial stages of the financial turmoil did indeed push up the JPY against the three big OECD currencies the last six months have seen an absolute surge in the JPY. Especially the move against the GDP is staggering although it must be seen in light of the fact that Sterling has been completely buggered on a wide scale during the past months. Obviously, this level of the JPY is wholly inconsistent with fundamentals and as we have seen before movements motivated by carry trade dynamics are subject to quick and abrupt reversals. In any case, with global central banks collectively heading for a global ZIRP regime it seems that old theories on carry trade dynamics and currencies may need to be calibrated; I suggest you to read one of Stefan Karlsson's latest posts for more on this. However, for the time being old habits linger and the the relative safety of a healthy external position is supporting the Yen. Having played the waiting for godot punt during the better part of 2008 (0-1 AS v Macro Man) I am weary about calling MOF/BOJ intervention in the JPY. Yet, currency wonks are still beginning to timidly voice the proposition that authorities may finally get enough at some point. According to GFTFx' director for currency research Kathy Lien 87.00 may well be magic level for the USD/JPY. Ms Lien points to the fact the BOJ is certain to be under considerable pressure from domestic companies to cushion the JPY's ascend as well as the simple fact that the JPY is now overshooting considerably. Darrel Whitten compares a USD/JPY at 80 with crude at 147 $ p/bl; over bought, which further suggest that investors are ready to reverse. And finally, Jonathan O'Shaughnessy also moves in to argue that the Yen is poised to drop lower. Three factors could motivate a reversal in my opinion; a sudden a sustained return of risk appetite, intervention by policy makers, as profit taking on a large scale in the context of current positions. Of the three the second is most likely at the current juncture (here I go again) with the last one being driven by this exact event. Traditional disclaimers apply in the sense that I am not a currency strategist, but it would seem plausible that within the arsenal deployed by Japanese policy makers a move to nudge the JPY back towards an acceptable level might become reality in the near future. Faced with this set of dire fundamentals the obvious question becomes what Japanese policy makers are doing about it. Without languishing too much in the realm of basic macroeconomics Japan, as other non-EMU nations, have two tools at their disposal; monetary and fiscal policy. In the context of the former, it was always a bit difficult to see what the BOJ could do in terms of tweaking the nominal rate since it was already running at 0.5% when the bad news decidedly hit the shores of Japan. The current stance of 0.1% must, in this case, be seen as symbolical to the fact that we have effectively re-entered QE and ZIRP. In this way, the BOJ is following closely, albeit with a lag, in the steps of Bernanke and the Fed who have not only slashed nominal interest rates to virtually zero, but also enacted a number of measures under the current QE scheme. One key path followed by the BOJ here is the focus on financing conditions for companies. According to the minutes of the last meeting in December the BOJ is heavily focused on alleviating the liquidity crunch for companies and announced the provision to buy 33 trillion Yen worth of corporate paper (A1 rating) through the first quarter of 2009. This focus seem warranted. According to Bloomberg, the spread between government and corporate A1 paper has widened 72.5 basis points since Lehman Brothers collapsed last year. This again is forcing bigger companies to ditch the debt market and apply for loans in banks which again is squeezing the ability of small companies to get to the emptying trough. If monetary policy makers are readily expanding the central bank's balance sheet to attack the problem of funding what is happening on the fiscal front? This is the real core of the problem that Japan faces in 2009, that previous fiscal policy did not attack the growing fiscal deficit in the good times, so there is little room to manoeuvre in the bad ones. Which is why the Japan economic outlook in 2009 is grim, grim and nothing but grim. Having said that, desperate times calls for desperate measures and only a few days ago Japan's PM Taro Aso managed, with difficulty, to pass a 4.7 trillion Yen stimulus package through parliament. However, Aso and the government should not rest on the laurels because of this. It is consequently widely held by domestic economists and observers that the package is too small to really have a lasting effect on its own thus suggesting that more packages are needed down the road. Given that we are in an election year, Aso may be inclined to deliver on populist grounds alone although of course it is difficult to see how any kind of fiscal measure could decidedly break the gridlock. Much more important then may be the plan by the government (see also Ken Worsley) to allow the Development Bank of Japan to enter the equity market and buy common as well as preferred shares. According to the plan, or at least as I get it, the Development Bank will not draw upon public funds directly in this initiative, but rather public funds will indirectly be supplied to cover the investments (i.e. the losses). Worsley informs us that 80% will potentially be covered. In summary, Japanese policy makers are in many ways offering the standard response to this crisis in the form of ultra loose monetary policy as well as fiscal stimulus. However, this is also where the comparison stops. Consider consequently the fact that monetary policy was loose long before the advent of the current crisis. If it did not help boost domestic demand at the time, it is difficult to see it having a meaningful effect now apart from the fact that it is needed in order for Japan to avoid a deflationary spiral. On the fiscal side, Japan is naturally constrained for reasons elaborated above. It remains to be seen whether the plans to invest directly in companies as well as their debt will help ward off big bankruptcies and thus mass layoffs. What a way to begin the posting again eh? Well, you should know my stance on Japan by now and if it was structurally bearish before it is bound to be considerably gloomier now. In many ways, Japan is pulling all the right strings in my opinion since I do feel that following the Fed's lead here in terms of concrete policy tools may not be the worst thing to do. The problem however is that Japan is constrained in a number of key areas. First, the whole idea of the liquidity trap and the inability for the central bank to reignite inflation expectations sprung from exactly Japan's experience in the 1990s and into the 21st century. Thus and while the Fed may clinch it, in terms of acting as the irresponsible policy maker suggested by the literature the BOJ has been trying this for the better part of two decades; with no luck. On the fiscal front the steps are also fundamentally sound I think, but once again Japan is constrained on the debt side and especially of the fact that before a single penny can be spent on the crisis at hand the fiscal authorities need to issue a handsome portion of paper just to cover the primary budget deficit. In terms of the immediate outlook for Japan it is consequently dire. As detailed above all gauges are pointing downwards and now that the push from external demand is decidedly faltering the last small shield of defence is down. At this point, Japan is left to hoping that foreign demand will pick up again during 2009 and that she will be able to latch on to any pieces there will be left. This looks unlikely but it is not impossible that we will see some emerging markets staging a recovery after the first two quarters. However, to believe in this hypothesis you need to be almost as optimistic as this note has been the opposite. Although the underlying trend is much more structural. There may of course be a myriad of reasons to this in the context of pass-through mechanisms and transmission mechanisms from energy and food inflation to core of core inflation. The main message here would be one of changes in inflation and thus how Japan steadily has moved towards a situation where inflation is primarily cost push rather than demand pull. I see that a follow-up has just been produced, and it is absolutely splendid. And don't give me that hoola-balloo about Japan being a surplus country and thus owing the money to itself. While certainly a mitigating factor in terms of sustainability these bonds are still assets with a value,and I would humbly submit that the shift of value from the government's future discounted revenues (which are declining, remember) over to domestic bond holders only works until it does not; this is to say, only until those very same revenues cannot cover the term payments. This is really a question of how many times you can sell the same bicycle, or in this case, the same and declining future stream of revenues. Actually, Morgan Stanley's Stephen Jen also stood on the other side of the fence, and was right as a result. The primary budget surplus (or deficit) of a government is the surplus excluding interest payments on its outstanding debt. 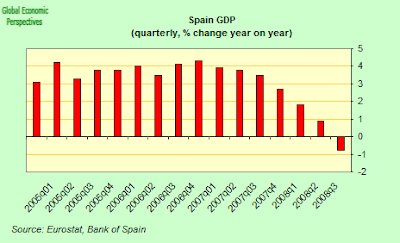 Spain's economy is now most evidently, and totally and completely officially, in its first recession since 1993. The final confirmation of this came yesterday when the Bank of Spain released its quarterly report on the Spanish economy. According to the bank, gross domestic product fell by 1.1% in the final quarter of 2008 (over the previous quarter), following a 0.2% decline in the third quarter. GDP fell year on year by 0.8%. 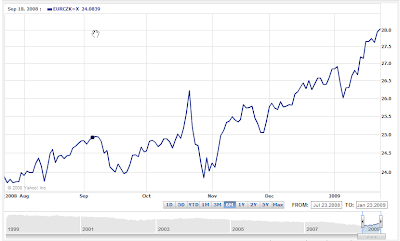 Basically the report confirms my analysis in this post which suggested that while technically speaking the recession started on 1 July 2008, the contraction really started in July/August 2007, and it should have been really obvious to everyone by September of that year that the party was well and truly over. According to the Bank of Spain the main component driving the contraction in the second half of last year was household consumption, with the contraction in household expenditure accelerating in Q4 when compared with Q3. 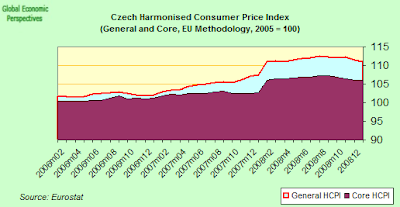 In particular, household consumption fell at a year-on-year rate of something over 1.5% in 2008 Q4, which meant that - taking the year as a whole - it was private consumption which contributed the most to the slowdown in GDP, to a greater degree even than the decline in residential investment (which was nonethelessdown 10% over the year). The slide in corporate investment also intensified in Q4, in large part as a result of the worsening economic outlook, the sluggishness of demand and the increasing uncertainty, all of this against a backdrop of financing conditions which were completely unfavourable to new business projects. As a result investment in equipment fell off markedly, by more than 7% year-on-year. On the other hand the contribution of net external demand to GDP growth was positive in 2008 for the first time since 1997, and added at 0.7 percentage points, which compares with a negative contribution of 0.8 percentage points in 2007. 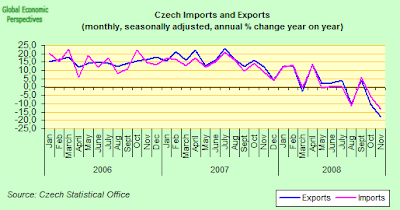 This "improvement" was almost totally the result of a decline in imports, which fell much more sharply than exports. As a result of the recessionary environment, employment dropped by 0.5% in 2008 (which compares with an increase of 3.1% in 2007) and the unemployment rate climbed to an 11.3% average for the year as a whole (13.9% in Q4), according to the Labour Force Survey figures. Inflation slowed dramatically inthe last quarter of the year, with the CPI rising at a 4.1% for the year as a whole (up from the 2.8% average in 2007), although in the second half of the year it fell significantly, hitting a years low of 1.4% in December, the lowest figure since 1998. Indeed the HICP differential with the eurozone average ended the year negative on a negative footing (-0.1%) – the first time this has happened since the start of EMU. My guess is that we may well see a spike in inflation in January - due to the foolish increases in administered prices - after which we should steadily head deeper and deeper into price deflation territory. The drop in household consumption and fixed capital investment was also to some extent offset by a surge in government spending. The government sector sustained aggregated domestic consumption in 2008, with government consumption increasing at a 5% rate over the year a whole. 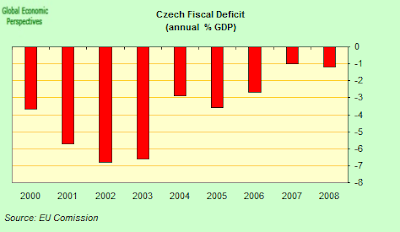 As a result public finances deteriorated rapidly, and moved from a surplus of 2.2% of GDP in 2007, to a deficit of approximately 3.4% of GDP in 2008. The public debt ratio was up by 3.3% in 2008 and reached 39.5% of GDP. 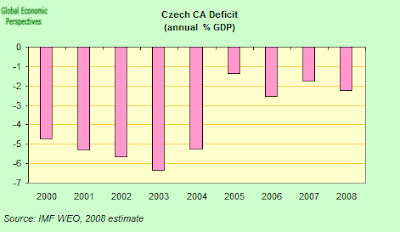 For 2009, the government now envisages a further increase in the deficit - at the moment estimated at 6% of GDP - although since this estimate is based on a forecast contraction of only 1.9% of GDP over the year and this is likely to be a strong underestimate (see below), the deficit could be 7% or 8%, even if there are no additional funds which need to be spent on the bank bailout (unlikely to be realistic, since more money than currently budgeted for may well be needed, as we are seeing in one country after another). If we get price deflation to boot, and thus a reduction in nominal GDP, then debt to GDP could easily be up by a full 10 percentage points in 2009. So what about the rate of contraction? 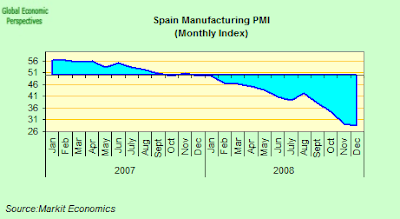 Well at the present time, as I indicate above, the Spanish economy is contracting at an annual rate of 4.4%. 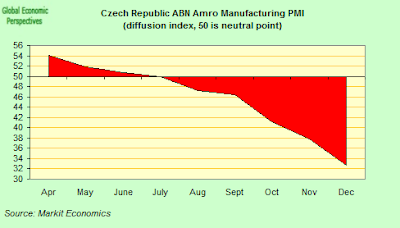 Now, if we look at the manufacturing PMI (see below), we can see that this coincides with a monthly average reading of around 30 on the index over the quarter. So we could say that a reading of 30 means a contraction of about 5% a year (to begin to calibrate for the future) but this is probably an underestimate, since we have seen a sharp increase in government spending (which is not sustainable at this pace, or better put, we may sustain the present levels, but we simply can't keep increasing by 5% a year, so the impact of government spending will start to wane) plus we have seen, as mentioned above, a significant positive impact from the trade balance - estimated to have been of the order of 1.7 percentage points in Q4 (in other words without this favourable movement in nthe balance the contraction rate would have been much larger). So really, without these two factors - the imports slowdown and the increase in government spending - we could easily have been talking about a contraction at an annual rate of 7% plus, which is, well, very, very large. But this is what a 30 manufacturing PMI reading might mean as we go forward, so we had just better hope that the index starts to tick up, hadn't we. The next results (for January) are out next week. Watch this space. The IMF Senior Regional Representative For Central Europe and the Baltics, Christoph Rosenberg, recently took me to task on RGE Monitor about my Latvian devaluation proposal (as did RGE's own Mary Stokes), and I would like now to take a closer look at some of the points they raise. In the first place, I would like to say that I obviously regard both Chrisoph and Mary as excellent economists, and I was in no way refering to them when I said that arguing in favour of sticking to the present currency peg constitutes trying to justify “virtually the unjustifiable” according to “the implicit consensus among thinking economists.” I do still hold that the consensus is with me, but that certainly does not mean I regard those who differ from me as "unthinking", and certainly hope I didn't give the impression that I was. And with that little "mea culpa", let combat begin. And what better way to do this than by looking at Christoph's own arguments, (see below, and I hope I am being fair), although before I actually get into this part, let me "fast forward" to what I see as the three central issues involved: the timing and duration of the correction (that we all agree is needed), the role of Latvia's special demographics, and the distribution of the impact of the eventual debt restructuring between external stakeholders (the EU fiscal structure and the foreign banks) and Latvian state finances. V Shaped or U Shaped? As I see it, some of the force of Christoph and Mary's argument lies in the idea that there is little possibility of Latvia being able to succesfully carry out a V shaped correction at the present time due to the hostile global environment, thus it is better (my words not theirs') for Latvia to "mark time" to some extent between now and (say) 2012 (when possibly the external environment will be returning to some sort of normality, again my feeling, not theirs), and I understand the force of this point, I really do, it's just that I don't think Latvia's social fabric will be able to withstand the sort of pressure it is going to be put under (and Edward Harrison has already highlighted this part, as I have in my longer post on the difficulties associated with introducing generalised wage reductions). The IMF report on the Stand-By Arrangement stresses time and again that political consensus is vital to carrying through the proposed "fixed-peg correction", and yet it seems as if we are already running into difficulties on this front. Also, and to try to keep this simple and as non-technical as possible, we are simply dealing here with trade offs, trade offs between the accumulation of bankruptcy and non-performing loans on the one hand, and the attraction of new FDI for manufacturing industry and getting growth through exports moving on the other. The trick is to get the balance right. Now the U shaped recovery puts greater weight on the former, while the V shape one puts it on the latter, and I think the choice is as simple as that really. But I would also add in a further factor (to be explored a little more below), and this is the cost of waiting (there is always a cost to waiting) in terms of the demographic transition Latvia is living through (I am thinking about both out-migration and the impact of population ageing and Latvia's declining potential labour force). I suspect that part of the difference between us lies in the fact that Christoph and I attach different values to the cost of waiting in the Latvian case, and the roots of this difference lie, at least in part, on the differing theoretical frameworks we are using. To be blunt, I do not live in what I consider to be the rather timeless and abstract world of neo-classical steady-state growth and convergence theory (for all of which we have precious little meaningful empirical evidence across the EU27), but in the real historical time of ageing and shrinking populations, non-linear growth trajectories and windows of opportunity. Latvia has between now and 2020 to get rich before it gets starts to accumulate so many age-dependency-related on-costs that it may, if it doesn't put in a well-founded spurt now, quite simply never close the gap. So Latvia is living in real historical time, and not an abstract theoretical one, and in the former, if you don't seize the opportunities you are offered with both hands, then you may well simply end up as tyre rubber on the highway of history, enjoying momentary fame only to end up as a historical irrelevance. 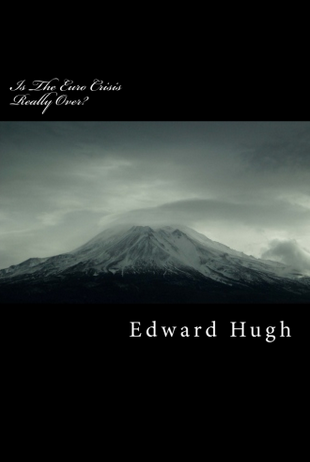 So although history doesn't simply keep repeating itself in a simple circular (or Poincaréan) fashion, tragedy is always tragedy, whether it is the first, second, third or nth time round. But perhaps "marking time" isn't really a fair analogy either, since obviously Christoph feels that the time in question can be put to good use - implementing structural reforms, rewriting the bankruptcy law to make debt restructuring easier, reducing wages and prices, etc, etc - but my worry is that all this will take place against a strongly contractionary atmosphere, with strong reductions not only in real GDP but also in nominal GDP - I mean if we are talking about a 5% plus contraction in real GDP, and (let's say, just as an example) a 3% reduction in the general price level, then we are talking about a drop of about 8% in the nominal value of GDP in 2009, and about another very large one in 2010, so let's be clear, these are contractions of a large order of magnitude (not far off the US 1930 - 33 ones) and my most serious doubt is about the ability of the Latvian social consensus to hold together through this, especially if there is no visible improvement in general conditions as a result. You need some sort of carrot, and not just good will. Now it may seem strange to adduce arguments from evolutionary psychology (not Evolutionary Psychology, please note) in a debate about macro economic policy, but I do feel that years and years of evolution have left us with a kind of asymmetric bias which means while we definitely (always and everywhere) don't like to see our wages and salaries actually cut, we have much less resistance to them being eaten away by price inflation (again, this is the whole point of Keynes's little tract "How To Pay For The War" - its just that this war is an economic and not a military one). So politically, it is easier in principle to maintain consensus around a devaluation which followed by tight controls on income, than it is to cut people's salaries outright. Another example which illustrates my point here comes from the recent German experience, where real wage deflation was effected over a number of years (1995 - 2005), and export competitiveness restored, by maintaining a wage freeze, and getting people (during the most significant part of this process) to agree to work more hours for the same money. But to do this in Latvia you need to be able to expand output and add jobs, which is why devaluation is, in my opinion, highly desireable. You cannot expect people to work for the same money and longer hours, and agree to the chap working next to them being dispatched off to the employment offices, things just aren't that simple in the real world. The bicycle is must easier to keep stable if you peddle forwards. So this brings me to the biggest problem I have to the whole U shaped correction idea in the Latvian context. I will readily agree with Christoph when he says that the Latvian labour force is extremely nimble, and indeed it is especially so when it comes to packing its bags and heading off in the direction of the frontier in search of work abroad. In fact it is so nimble that it manages to do this without the Latvian statistical office even noting that the people have gone, that's how nimble they are. So this is the outcome I really fear most, the one which means that when Latvia does eventually start to recover, this recovery will only take place with a time lag, and in the wake of an expansion in some key West European (and especially Nordic) economies, which will mean that their will be another loss of workforce in the slipstream their take off will create, a loss which can become a very serious drag on future growth, and indeed may well restrict even further the inflation-free level of sustainable growth for the entire Latvian economy. 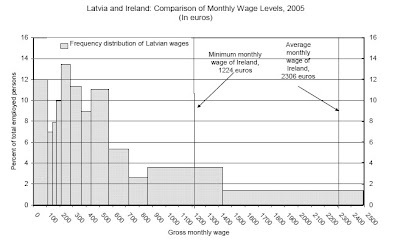 The chart below, which compares the Irish and the Latvian wage distributions comes from an earlier period (and indeed was prepared by the IMF itself), but it does give some idea of the problem, since there is a clear wage slope running across Europe from east to West, and much needed Latvian workers have an unfortunate tendency of trying to climb their way up it. So the situation envisaged in the "fixed-peg correction" - namely a period of negative economic growth and substantial wage contraction - will probably only produce yet another round of out-migration (although this time, in all probabity, it won't be to Ireland) which will in turn makes the domestic wage correction even more difficult to implement (another kind of 'vicious loop'). 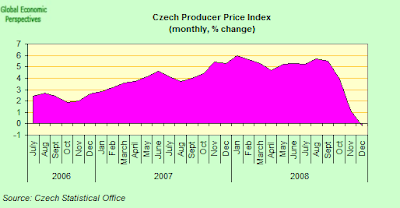 It is interesting to note that the IMF were raising this sort of issue with the Latvian authorities during the earlier overheating phase, but the Latvian solution (which prevailed at the time) was really to tolerate higher than desireable wage increases in order to disuade Latvians from leaving. So there is prior evidence that whatever the promises (and even, lets be generous, the good intentions) local governments find it very hard to stand in the path of their voters when these want social improvemnt, and indeed such vulnerability could come from the most compassionate and noble of motives, the problem is these are simply misplaced. Here (see below) is the IMF Structural Roadmap as it appears in the latest report, and as can be seen, there is a heavy emphasis on the legislative changes needed to carry out the debt restructuring, which gives some idea of the important role this played in the decision making process. • Cabinet of Ministers to adopt decision that reforms controls over budget execution (December 31, 2008). • Adopt operational guidelines clarifying procedures for provision of emergency liquidity assistance (December 31, 2008). • National Tripartite Co-operation Council will establish a Committee to Promote Wage Restraint (January 31, 2009). • Complete focused examination of the banking system (March 31, 2009). • Develop comprehensive debt restructuring strategy (April 30, 2009). • Amend banking laws to give FCMC, BoL and Government powers to restore financial stability in case of systemic crisis (June 30, 2009). • Adopt an amendment to the Budget and Financial Management law to strengthen financial responsibility, transparency and accountability (June 30, 2009). • Amend insolvency law to facilitate orderly and efficient debt restructurings (June 30, 2009). I have to say that I am really rather surprised at a numberof the things I found on reading the IMF report in detail. In particular I discovered that the true size of the 2009 annual fiscal deficit is going to be 17.3% and not the "mere" 4.9% that appears in the final budget accounts. This is not a problem of "massaging" (I am not suggesting that) but a by-product of the cost of bank restructuring - which involves recapitalisation and the acquisition of "troubled assets" - and these costs, under the new accounting rules, are classified as held to maturity, and not marked to market in terms of their valuation, nor, under the present convention do such liabilities appear as part of the headline fiscal deficit number. Nonethless Latvia's gross public debt is now set to rise, and dramatically. 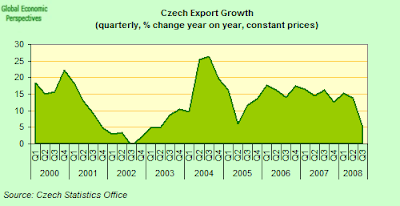 It is set to go up from 8.3% of GDP in 2007, to 14.3% in 2008 and to an estimated 46% in 2010. And this is all basically to pay for the bank bailout (which is estimated by the IMF to be likely to cost of $1.868 billon in 2009) and not in order to address issues in the broader economic crisis. The worrying part of all this is that if we don't get the best case scenario, and find ourselves, for example) not with a U- but with an L- shaped non-recovery, then this debt to GDP (and indeed even the annual fiscal deficit itself) may start to head above the EU 60% and 3% rules in 2011 or 2012, thus putting in jeopardy the IMF's own exit strategy for Latvia of eurozone membership. The IMF themselves go to some length to point out that the best case outcome critically depends on maintaining a political will which (as we are starting to see) may not be so strong as they were lead to believe at the time of making the agreement. "Finally, standard debt sustainability analysis may not capture all of Latvia's characteristics, given its dependence on foreign bank borrowing for credit intermediation and its role as an offshore financial centre. First, Latvia's net foreign debt is much lower (around 70 percent of GDP), as it reinvests many of the non-resident deposits in assets overseas. The value and liquidity of these assets then becomes key. Second, much of its foreign borrowing is backed by domestic assets. Thus external debt sustainability will depend on whether these assets recover value and will be able to generate future returns to service the debt." As I read it, this means that Latvia is a miniture version of Iceland or the UK, and that as well as a macro consumption boom/bust disaster there is a non-domestic-loan recovery problem inside the banking system of some magnitude. As the IMF itself says the value and liquidity of Latvia's overseas assets is one of the "keys" to the problem. The other "key" depends on whether or not domestic assets recover their earlier value, an outcome which given even the internal price deflation strategy proposed by the IMF seems fairly unlikely, at least over the relevant time horizon. The bank restructuring component is so expensive largely because the Latvian owned Parex bank (assets equivalent to more than 20% of GDP) was taken over by the government following a run on deposits and the consequent need to avoid default on the 775 million euros ($1 billion) of syndicated credits due in 2009. In fact the problems at Parex were one of the main reasons Latvia went to the IMF and EU for financial help in the first place - since in theory the issuers of the syndicated credit had the right to demand repayment of the debt immediately following a change in ownership at the bank, and the government needed the institutional support to be able to renegotiate and rollover the debt. As a result the Latvian authorities have been able to issue guarantee for the refinancing of isyndicated loans of EUR775 million due in 2009 (EUR275 million in February and EUR500 million in June). The credit ratings agencies, and in particular Fitch, believe that in the current global economic climate a rapid future sale of the bank difficult and that the government will have increasing difficulty in the future refinancing the syndicated loans. Moreover, the risk of further deposit withdrawals from Parex bank, especially by non-residents, will continue despite the effective nationalisation of the bank. The new Parex chairman Nils Melngailis was quoted recently as saying that the bank's value was anywhere between 2 lats ($3.65), the price the state paid to buy out the two previous owners, and 600 million euros. If all this is correct, then my guess is that we could even be eventually looking at the possibility of a Latvian sovereign default. I mean, personally speaking, I am pretty sure the medicine the IMF are administering just won't work (for the reasons I am putting forward) and that things will deteriorate. But sovereign default something I would never have imagined before I started digging a bit deeper into the whole situation. And the IMF should seriously be thinking about this. Latvia's level of public debt was previously very low, and then whooosh. Fitch seem to share this view, since they have maintained their negative outlook following last November's downgrade. Fitch Ratings has today downgraded the Republic ofLatvia's long-term foreign currency Issuer Default Rating (IDR)to 'BBB-' (BBB minus) from 'BBB', Long-term local currency IDRto 'BBB' from 'BBB+' and Country Ceiling to 'A-' (A minus) from'A'. The Short-term foreign currency IDR is affirmed at 'F3'.In addition, Fitch has placed Latvia's sovereign ratings onRating Watch Negative (RWN). 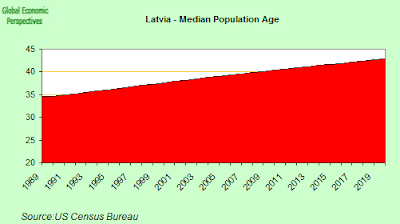 Soon enough Latvia will have to face all the on-costs of pensions, health etc for the growing numbers of old people as the median age rises (see chart above). Claus Vistesen and I are busily trying to "calibrate" things here, since notionally Latvia's median age is a lot younger (41) than that of Japan, Italy or Germany (43). 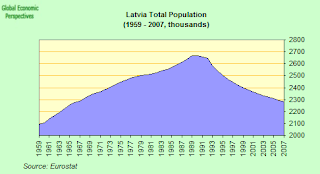 But then, on the other hand, Latvians live on average ten years less. So people stop working earlier, and since the really large health care costs are during the last 5 years of life, and this doesn't change substantially if those involved are between 65 and 70 or between 80 and 85. So there is an ageing "calibration" issue here - one which non of the multilateral agencies involved have yet taken on board as far as I can see. Also we need to move the saving and borrowing age ranges around a bit when we come to think about the life cycle (to adjust for shorter working lives etc). And this "just where is all the money from the loans going" issue is a much bigger question than simply a Latvian one. The IMF original loan to Hungary, for example, included HUF 600 billion (about 20% of the total loan) to be allocated to bank bailout plans, 50% of which was earmarked for capital injections while the other 50% was to be used for state guarantees for commercial banks. The government later boosted this HUF 300 billion guarantee fund to HUF 1,500 billion, however today it has been announced that more of the IMF loan facility may be used to back loans right up to the 1,500 billion HUF level - which surely gives us an indication of the severity of the problems they are having. 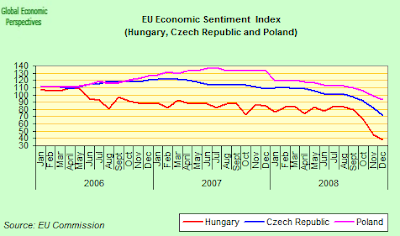 But what concerns us here is that as a result of these and other measures Hungarian debt to GDP is now projected to rise (Januarry 2009 EU Commission forecast) from approximately 65% in 2009 to 79% in 2010, and of course there can be downside (or if you prefer, upside) on this. So both Hungary and Latvia look dead set to me to receive further credit downgrades, downgrades which will only serve to materially worsen the situation. And thus there is a considerable danger of a self-perpetuating downward spiral, especially if due to the weighting towards the bank problems the present package of measures simply don't work. People are vastly overestimating the power of longer term structural reforms in the context of such a sharp downturn. All very troubling. Also, there is another fundamental reason for devaluation, and that is the ability to regain control over an independent monetary policy, since handling a sharp and sudden deflationary shock may well be much harder with a fixed-wheel lock-in to the ECB benchmark rate. Ben Bernanke himself gave us a good example of how the sort of debt deflation process to which Latvia is going to be subjected works in practice, and why it is so dangerous in a modern economic context) in an early paper he wrote on Japan. To take an admittedly extreme case, suppose that the borrower’s loan (taken out prior to 1992) was still outstanding in 1999 , and that at loan initiation he had expected a 2.5% annual rate of increase in the GDP deflator and a 5% annual rate of increase in land prices. Then by 1999 the real value of his principal obligation would be 22% higher, and the real value of his collateral some 42% lower, then he anticipated when he took out the loan. These adverse balance-sheet effects would certainly impede the borrower’s access to new credit and hence his ability to consume or make new investments. The lender, faced with a non-performing loan and the associated loss in financial capital, might also find her ability to make new loans to be adversely affected. This example illustrates why one might want to consider indicators other than the current real interest rate—-for example, the cumulative gap between the actual and the expected price level—-in assessing the effects of monetary policy. It also illustrates why zero inflation or mild deflation is potentially more dangerous in the modern environment than it was, say, in the classical gold standard era. The modern economy makes much heavier use of credit, especially longer term. Further, unlike the earlier period, rising prices are the norm and are reflected in nominal-interest-rate setting to a much greater degree. Although deflation was often associated with weak business conditions in the nineteenth century, the evidence favors the view that deflation or even zero inflation is far more dangerous today than it was a hundred years ago. And it seems Lavia is now about to enter a sustained period of price and wage deflation (and thus loan to income inflation) with no monetary and no fiscal tools to attack the problem. 1/ a devaluation in Latvia would have severe regional contagion effects. I think that on this point we are all in basic agreement. On my view, the EU and the IMF need a coherent common strategy to address the whole situation in the East (at least across those countries who form part of the EU), and I think we are rapidly getting past the point where problems can be dealt with on a piecemeal basis. I mean. clearly some of the points here post date our earlier debate, but part of the foundation of my initial argument was that the whole situation was at risk of becoming so serious that nothing less than a concerted regional initiative would have the credibility and the robustness to work. It may be that outright eurosisation of the entire group maybe the only viable way to go, but I need to argue this separately and substantially, so I will not go into this further here). But, be that as it may, the leading question is that even if eurosiation is to be contemplated, Latvia, Lithuania, Estonia and Bulgaria all need to come of their pegs and lower the parity at which they would enter, and even if the situation in each case is different, the problem is going to be the same, so my underlying point would be better to do this in a cordinated way, and indeed the decision by the Hungarian government to come off their band back in May could be seen as a first step in just this direction. This is doubly the case since when we talk about regional consequences, we can also talk about the regional effects of a strong devaluation of the UK pound, the Swedish krona, the Russian ruble, the Ukrainian hryvnia, the Czech koruna, the Hungarian forint, and the Polish zloty. Basically the economies in all the aforementioned countries all face a similar problem - domestic demand is down and they need to export, and they are all addressing this by the application of a mixture of devaluation and price deflation, and basically I don't see why the Baltics should be so different, and why we (or at least the IMF, the WB and the EU) don't treat the three Baltic states as one single group here. 3/ Latvia’s preference for the peg is strongly supported by all foreign stakeholders, including the EU and its Nordic neighbors..........it seems unlikely that they will cut their losses and pull out, as Japanese banks did during the Asian crisis. Well, this is certainly the case, but it is not at all clear that these stakeholders could not be brought over to a devaluation strategy. There is currently a lively debate going on in Sweden about just how much responsibility the Swedish government and monetary authorities should accept in the context of what is happening in the Baltics (see here, and here), and more significantly, the Group Of Ten West European banks with most exposure to the CEE economies has started to lobby for an initiative from the ECB and the EU Commission to address the problem of the inevitable bank losses (since I take it we are agreed that the defaults will be no less on the internal deflation approach, and may well, as Krugman suggests, be greater as those who have borrowed in local currency are also forced into default). 4/ A devaluation would not significantly reduce Latvia’s external financing needs. I am not sure about this. Obviously a devaluation which was sharp enough to remove all further worries about future devaluations would take a lot of pressure off the country's reserves. The shrinkage in the CA deficit would also, as you say, help a little, as would the fact that internal saving would start to improve domestic liquidity. While it would shrink the current account deficit further, private sector roll-over rates might not improve because the higher external debt to GDP ratio would likely result in credit agency downgrades to junk status and trigger the immediate repayment of most syndicated loans. I completely accept this point, but assume that the devaluation strategy would need to be accompanied by a loan restructuring package. Evidently this will be necessary in any event, on the devaluation variant they restructuring will come sooner, but against the difficulties this may present for a Latvian legal framework which is ill equipped to address the problems which will arise can be offset the advantages of getting all the bad news out of the way early. 5/ there are advantages to a U-shaped adjustment via factor price compression over the V-shaped recovery that is often associated with a devaluation.....Christoph makes the entirely valid point that Latvia’s banks (both domestic and foreign owned) and its legal system are at this point quite uprepared for the sort of stress a comprehensive debt restucturing process would put them under. By drawing the process of bankruptcies and nonperforming loan accumulation out a bit, Christoph argues, the authorities may well buy time to improve the country’s insolvency regime, strengthen banks’ capital base and allow private debt restructuring. Well, this is essentially the same set of issues as in argument 4. There are advantages in drawing out the bankruptcy process, but against these advantages need to be offset the problems posed by reform fatigue, as people are asked to sacrifice over a long period with no visible benefits to see for their effort. And there is no guarantee that the towel won't simply have to be thrown in at the end of the day on the U shaped recession, with a hasty devaluation being carried out, and the U being converted into a UL, with the bounce back only coming much later. 6/ it is questionable whether a devaluation would quickly boost exports, given the global environment and the structure of its exports. Re-orienting the economy towards tradables will require structural reforms which are envisaged in the program. Basically, I think we are back to the "waiting room" approach again here. Export lead growth is not really a credible option at the moment, so the argument goes, given that the external conditions are extremely unfavourable, and that Latvia's economy is dominated by non-tradeables, financial services and construction. All of this is undoubtedly true, but my argument is that you have to start somewhere, and may own view is that it is better to start tomorrow, rather than the day after, and I think the key to breaking the logjam is attracting greenfield site FDI, but to do this you need to get your operating costs down, and the V shape correction achieves this outcome quicker than the U shaped one. 7/ Latvia has a very flexible economy, especially a quite nimble labor market. Really I don't know what to make of this argument, since if this is the case, why was it not more evident during the years of dramatic wage inflation. Wage cuts of up to 25 percent do seem, as Christoph says, large, but so does the tripling of nominal wages between 2001-07 (doubling in real terms), and unless we get to grips with why all that happened in the first place (that is we take a good look at what may be the real Latvian capacity growth rate without inward migration) then I feel I remain unconvinced that we are suddenly about to see a newborn agility in the Latvian labour market. What I see are rather labour market rigidities, and a resistance to change. So where does all this leave us? Well basically that what we have on our hands is one hell of a mess, and that here there are no easy solutions. Did anyone tell you we lived in an imperfect world? Well what is going on in Latvia is surely as good an illustration that you are likely to find that this is the indeed the case. There are no easy, quickfix, policy solutions, and I fully understand Christoph's dilemma, and the difficulty associated with decision taking in this case. But, while nothing is guaranteed to work, some approaches may turn out to be better placed than others, and it is my considered opinion that the best way of addressing the Latvian problem is by trying to kick-start the economy via devaluation, and to then tackle the wage increase problem by explicitly opening Latvia's frontiers to external migrant labour (as, for example, the Czech Republic have, to some extent, done). Such devaluation, backed by imaginative enough greenfield site support from the government, could attract the FDI, and alongside it the migrants to provide the manpower for unskilled positions, with better educated Latvians being able to get involved in some of the higher value work. If something is not done to break the population vicious circle, and the meltdown in internal demand and property prices as young Latvians seek work elsewhere then the outcome is all too clear, although not for that any less tragic, as Krugman suggests. Of course, some may wish to object at this point that devaluation has the same effect on wages as wage cuts do, and they would be right, but the point is the overall level of economic activity is greater on the V shaped approach (this was Keynes', and is today Bernanke's, basic insight). Latvian GDP is about to be thrown, from a period of trying to operate above capacity, to one where for an extended period of time it will operate below capacity. This can never be a good solution. On the V shaped recovery scenario the time path of GDP is higher, and the possibility of finding remunerative employment for each and every individual Latvian is to that extent greater. More idle resources will be put to work at a time when there is huge slack in the global system, and energy and material costs are at very low levels. Investment (building factories etc, buying machinery and equipment) simply couldn't be cheaper . Putting the resources to work to make this possible quite simply can't be a bad thing, or so I contend, and certainly not if the alternative may be sitting back and waiting till you have a sovereign default coming crashing in on top of you. I see plenty of work for Latvian parliamentarians (passing much needed laws etc) in the current proposals but I see comparatively few initiatives which will keep the idle hands of Latvia's valuable human resource base from freezing over. Let us be clear, of course there is no single clear "cure all" remedy here, but I think we need to say strongly that the earlier attempt to stem the migrant out-flow by being lax on the wage inflation front was to invite disaster (and the disaster of course came), whereas now, excessively compressing wages as the solution will have the impact which was previously feared. Finally Christoph has one additional point which really serves as a conclusion and a monument to all this, and that is the idea that Latvia has a clear exit strategy from its currency predicament: euro adoption. As Christoph says, the Latvian authorities are determined to work to meet the Maastricht criteria in 2012. Certainly entering the euro zone will not do away - at a click of the finger - with the hard lifting necessary to address the competitiveness and high external debt problems (as he suggests in his avoiding the Portuguese trap article, and I go through in my Portugal Sustains post here). But it would offer support to a struggling Latvia and help bring back investor confidence. The point is, at which exchange rate should Latvia enter ERM2? Indeed, it is now apparent - if you read the IMF staff report on the standby arrangement, on their website, that they favoured an expansion of the band to 15% (which basically means 15% devaluation) and it was the EU itself who objected and pushed to retain the peg (see appendix below). It is not difficult to see the problems a Latvian devaluation might face in the light of the Parex related issues without direct euroisation (or EU fiscal support), but the thrust of my argument here has been that these difficulties (credit rating downgrades, sovereign default vulnerability) are going to come anyway. Indeed Latvia had its foreign-credit rating cut to Baa1 by Moodys on January 7 2009, the second such downgrade in three months, with the agency citing increased risks of a prolonged economic decline (read L shaped recession). Basically, the EU objected to the IMF proposal for emergency eurozone membership on the grounds that this would sat a precedent in other cases. But I really do feel that the Commission (and the ECB presumeably) are being ridiculously pig-headed here. We have an emergency on our hands, and exceptional measures are called for. c) A new Lisbon Strategy and Stability and Growth Pact code involving much stricter conditions and stronger Commission powers and sanctions. c) is the necessary and prior condition for giving consideration to (a) and (b) and not the other way round. Finally, thank you, one and all, who have struggled forward and reached this point. In particular thank you for being so patient with my verbal largesse. I am trying to contain it, I really am. The authorities and staff examined the merits of alternative exchange rate regimes. A widening of the exchange rate band to ±15 percent (as permitted under ERM2; currently Latvia has unilaterally adopted a ±1 percent band) would result in a larger initial output decline, since adverse balance sheet effects would reduce domestic demand. However, competitiveness would improve more quickly, reducing the current account deficit and fostering a more rapid economic recovery. The case for changing the parity would be stronger if it could be accompanied by immediate euro adoption. Technically, this would address many of the risks described above, and give Latvia deeper access to capital markets. With its negligible public sector debt, the government would also find it easier to borrow in euros on international capital markets. However, the EU authorities have firmly ruled out this option, given its inconsistency with the Maastricht Treaty and the precedents it would set for other potential euro area entrants. The main advantage of widening the bands is that it should eventually deliver a faster economic recovery. Although growth would be depressed in the short run by balance-sheet effects (see below), the economy might then bounce back more sharply, and a Vshaped recovery would likely start in 2010. This reflects a faster improvement in competitiveness since high pass-through (reflecting Latvia’s openness to trade and liberalized movement of labor within the European Union) would be dampened by the negative output gap. Enhanced competitiveness would also reduce the current account deficit more quickly. This would come mainly from import compression, with a relatively slow response of Latvia’s underdeveloped export sector, especially as the external environment is not as supportive as in previous devaluation-induced recoveries as Argentina, Russia or East Asia. However, balance-sheet effects would cause a sharp drop in domestic demand. The net foreign currency exposure of Latvia’s private sector is around 70 percent of GDP, with the corporate sector’s foreign currency open position roughly double that of the household sector’s. A 15 percent devaluation against the euro would increase private sector net foreign currency exposure by 11 percent of GDP, two thirds in the corporate sector and one third in the household sector. Mismatches between owners of foreign currency assets and liabilities suggest that devaluation may cause substantial redistribution effects. Private consumption would fall by around 6 percentage points due to negative wealth effect as net foreign debt increases, house prices decline, debt service costs increase, and consumer confidence deteriorates. Experience of other countries suggests that a devaluation of this magnitude would lead to a 5 percentage point decline in private sector investment. 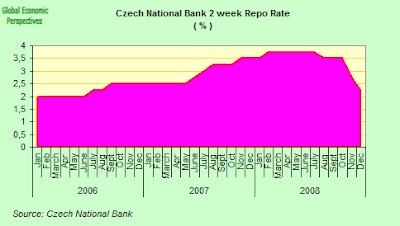 Euroization with EU and ECB concurrence would also help address liquidity strains in the banking system. If Latvian banks could access ECB facilities, then those that are both solvent and hold adequate collateral could access sufficient liquidity. The increase in confidence should dampen concerns of resident depositors and also help stem non resident deposit outflows. However, this policy option would not address solvency concerns and has been ruled out by the European authorities. If combined with a large upfront devaluation, there would be an immediate deterioration in private-sector solvency, which could slow recovery. Privatesector debt restructuring would likely be necessary. Finally, the European Union strongly objects to accelerated euro adoption, as this would be inconsistent with treaty obligations of member governments, so this option is infeasible. Iceland 2009: "que se vayan todos"? Just two years after holding a parliamentary election, voters in Iceland are likely to return to the polls next May 9 for an early general election. Normally, the poll would not need to be held until 2011, but these are anything but normal times in the Nordic island nation, whose economy has been devastated by the ongoing global financial crisis. With all of Iceland's three major banks under receivership since October; the national currency (the krona) having lost over half its value and the stock market over 90 percent of its value; inflation and unemployment on the rise; and the GDP expected to contract by ten percent this year, public discontent over the perceived mismanagement of the economy by the coalition government of Iceland's two major parties - the conservative Independence Party and the left-of-center Social Democratic Alliance - has fueled mounting protests, first on a weekly basis and more recently on a daily basis. The protests, which have drawn crowds of up to six thousand - a respectable figure for a country with a population of just over 300,000 - had been peaceful until last week, when they suddenly turned violent. In response, Prime Minister Geir Haarde announced he would call an early election for May 9; he also indicated that he would step down due to health reasons, having been diagnosed with esophageal cancer. Prime Minister Haarde initially let it know he intended to stay in office until the early election was held, but protests continued to take place, demanding the government's immediate resignation. Minister of Business Affairs Björgvin G. Sigurðsson subsequently announced he would resign from office immediately, and Haarde's grand coalition government came apart shortly thereafter. 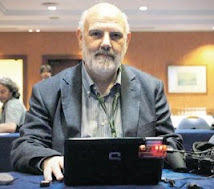 In many ways, the events currently taking place in Iceland are reminiscent of developments in Argentina during that country's economic meltdown in late 2001, in which increasingly intense, violent protests forced the ouster of then-president Fernando de la Rúa under the rallying cry of "¡Que se vayan todos!," or "Away with them all!" - "them" being the politicians. 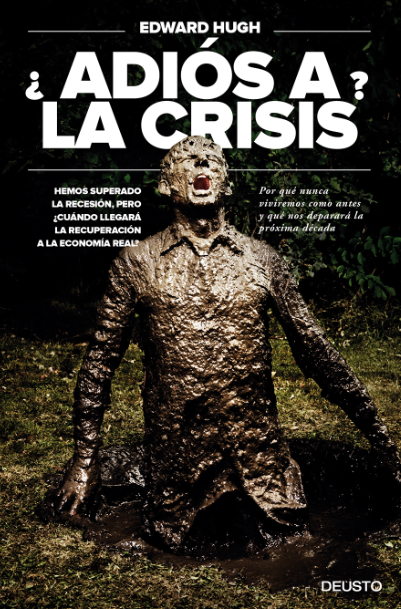 To be certain, voters in Argentina didn't get rid of all the incumbent elected officials, but the financial crisis of 2001-02 crushed de la Rúa's Radical Civic Union (UCR), which until then had been one of the country's major political parties, and obliterated the Radicals' allies as well. Likewise, Iceland's ruling parties may be in for a major setback in the upcoming election: opinion polls indicate that the Independence Party - which has dominated Icelandic party politics since the country severed its union with Denmark in 1944 - may lose its pre-eminent status, while support for the Alliance has fluctuated wildly, with more recent polls suggesting the party is likely to lose considerable ground as well. The two parties that currently stand out to gain the most are the opposition Left-Green Movement - which stands to the left of the Alliance and appears set to become the largest party in the upcoming election - and the agrarian, middle-of-the road Progressive Party. The Left-Green Movement has never been in power, while the Progressives has held office frequently, most recently from 1995 to 2007 as the Independence Party's coalition partner. Meanwhile, Iceland's grass-root movements may also take part in the upcoming election, and they could find fertile ground for their agenda: according to one opinion poll, eight percent of voters would support parties other than the ones that ran in the preceding election. At any rate, no single party is likely to gain an overall parliamentary majority under Iceland's proportional representation system (reviewed in Elections to the Icelandic Althing), and the election winner will have to find coalition partners in order to form a government. That said, it remains too early to tell what kind of government may emerge from the election, all the more so because unlike in most of the other Nordic countries, right-left coalitions such as the outgoing Independence Party-Alliance administration are a fairly common occurrence in Iceland. Iceland President Ólafur Ragnar Grímsson has asked Social Democratic Alliance leader (and outgoing Minister for Foreign Affairs) Ingibjörg Sólrún Gísladóttir to form a minority coalition government with the Left-Green Movement, which would also be supported by the Progressive Party. However, Gísladóttir, who underwent a brain tumor operation last year, is expected to appoint Minister of Social Affairs Jóhanna Sigurðardóttir as interim prime minister. If confirmed, Sigurðardóttir - who remains highly popular - would become Iceland's first ever female premier and the world's first openly gay head of government. Will All Be Well, And End Well, In Estonia?